A step-by-step tutorial on how to create your own adorable little tot using my Baby Portrait Creator. 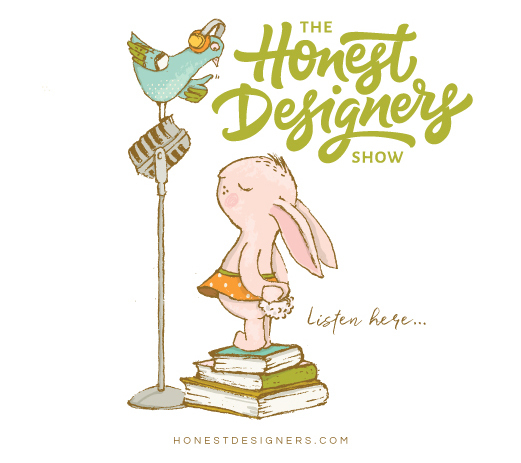 With just a few clicks, you can build your own whimsical character to suit your next baby project. 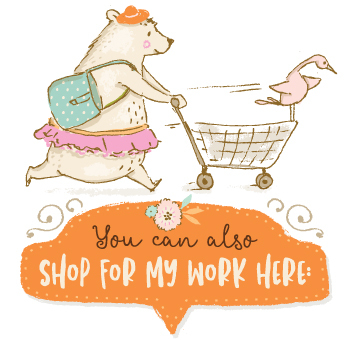 Designing birth announcements, birthday invites, birth stats, nursery art and more couldn’t be easier! A lovely gift for a mom to be! This kit is 100% compatible with my original Personalised Portrait Creator, making little baby a perfect addition to your family portraits. 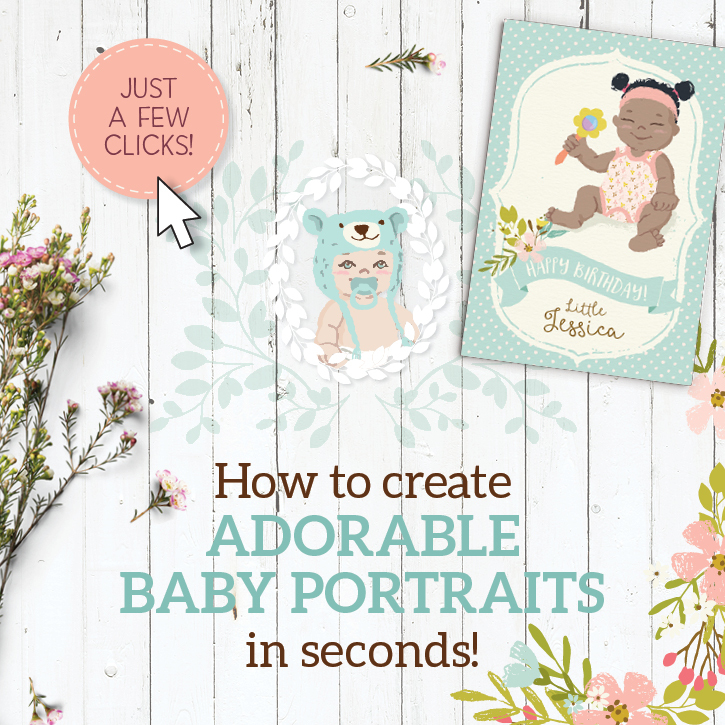 Get your copy of the Baby Portrait Creator here. Hello! I just purcahsed this amazing creator and have been playing around with it having so much fun! I am fairly new to photoshop so the tutorial helps a bunch! I am having a bit of a problem with the onesie though. I changed the pattern and when I go to resize the baby the new pattern stays the same size and doesn’t adjust with the baby. Would you be able to tell me how to make this work? Thank you so much for your purchase, it’s much appreciated! So happy to hear you are enjoying creating your portraits! I’m not sure how you have scaled the baby, whether you did a copy merge from the Edit menu to paste into another doc, or whether you are just resizing the baby with all the layers in tact. But either way, it sounds like you may need to merge the pattern down with the onesie. To do that, make sure you are on the pattern layer you changed, then on the fly-out menu in the Layers panel, select Merge Down which will merge the pattern into the Onesie layer and you should now be able to resize it all together. Hope that helps! I purchased this on sale on Design Cuts, after wanting it for so long. I just realized that I can’t see all the layers in Photoshop Elements 12. Do I need the full version of Photoshop or is there some way around it? The required software for the Portrait Creator and the Baby Portrait Creator is Adobe Illustrator CS3 – CC or Adobe Photoshop CS3 – CC. So to answer your question, yes you would need the full version of Adobe Photoshop CS3 version or newer. I have however heard from Photoshop Elements users that have version 18 that it works perfectly – I haven’t been able to test that myself but it seems to have no problems and brings in all the layers and elements. I’ve also recently tested the PSD files in Affinity Designer and those work well in that app too which is really great news as this is a fraction of the price of the Adobe apps. Hope that answers your question. If you have any other questions at all, please don’t hesitate to let me know. I’m having a blast creating baby portraits. But I am having a little difficulty figuring out the bonus elements. More specifically how to add the frames and banners with photoshop. Can you give me some tips Thanks! To use the extras all you need to do is drag and drop the png files into your working Adobe Photoshop file. I recommend saving your baby portrait as a PNG file first with a transparent background – to do that just turn off the background layer, then go File > Save As > choose PNG. Then create a new Adobe Photoshop at the final size of your composition. Then simply drag and drop your baby png and any frame or banner you’d like to use. Each time you drag and drop your png into the open Adobe Photoshop file, just resize and move into position. You can also add any colour to your background layer, add text using the Text tool and any other png element to this doc. Dragging and dropping the png should automatically create a new layer each time which is great for editing in the future. Don’t forget to save your doc as a PSD file if you want to keep the layers, or a JPEG if you want a flat file. Hope that answers your question. If you have any other questions at all, please don’t hesitate to let me know.